dance.net - My new solo dress! (10155688) - Read article: Ballet, Jazz, Modern, Hip Hop, Tap, Irish, Disco, Twirling, Cheer: Photos, Chat, Games, Jobs, Events! Just got my new solo dress in the mail today and thought I would share it with you all! 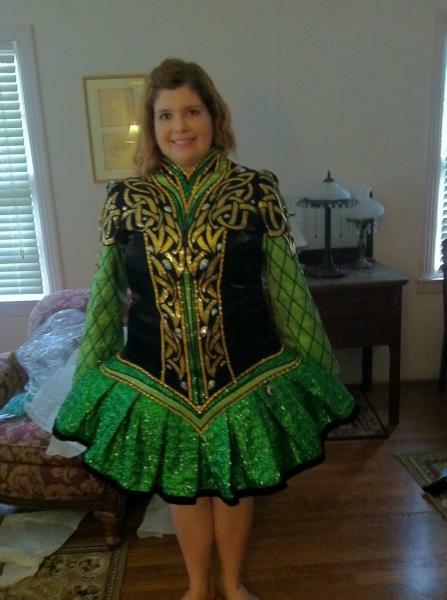 Hard to believe it's been almost ten years since I bought my first solo dress and shared it here on dance.net. The dressmaker is Kirations, who was utterly wonderful to work with. I can't wait to wear it at the SRO in two weeks! I didn't get a picture of the back but it is an old-school soft cape that's also reversible. If you're going to be at the SRO, come up and say hi! I'm dancing on Saturday but will be there the whole weekend (working the IDM booth on Friday afternoon as well). 24 Replies to My new solo dress! re: My new solo dress! Love love love! Let me know the next time you're in Austin because I want to see you and Tine dance! Shady Grove afterwards? Because I'm there! Beautiful! I hope it brings you lots of luck at the SRO and beyond! its beautiful! I'll be at sro (not dancing ) I have very curly blond hair and a walking boot. I'll say hey if I see you! Just gorgeous! I really like Kirations designs. Now I know who to say hi! to at the SRO. It's lovely; Kira did a great job on it! Good luck at SRO!! That is a freaking goregous dress! Are you ever in CA? I would love to see you dance! I LOVE it! I can't wait to ooooh and aaaah over it at the SRO. Gorgeous!!!! I love the knotwork especially!!!!!!! Best of luck in it--definitely post stage pictures when you have them. Absolutely beautiful! Kirations always makes beautiful dresses, she's so talented. So beautiful! Love the colors and the knotwork. 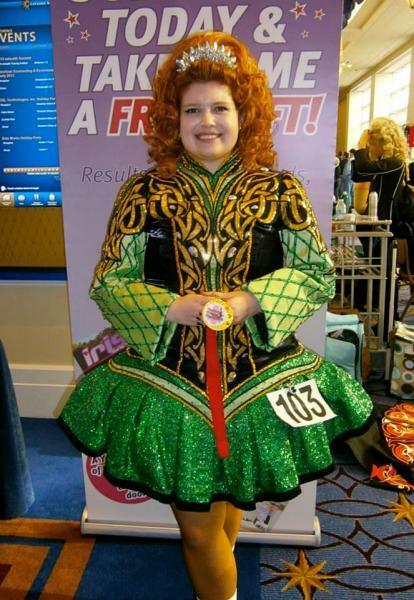 Best of luck to you at your Oireachtas! Oooh, I ADORE the colors! It looks great on you! Funny you say that because my teacher's sister has a school in Orange County and we would love to go to her feis, usually held in July (we have family scattered throughout Southern California). She didn't hold it last year though so I'm afraid our chance might be gone! I'm hoping it's just because the Nationals were in Anaheim in 2013 and maybe she thought people wouldn't bother to travel twice. p.s. I remember you first solo dress post...can't believe it's been ten years!! It is so lovely! Enjoy dancing in it, too. Congratulations on your lovely new dress! Beautiful dress! Best of luck! 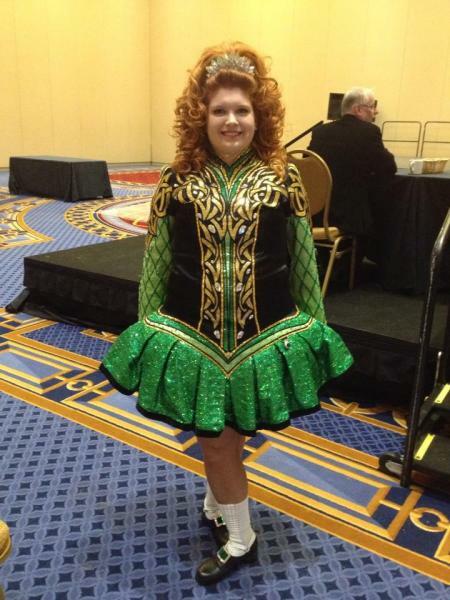 Here's a few pictures from the Oireachtas with the full "look". The wig is...an interesting story. I probably won't be making it that voluminous next time around (though I AM from Texas, and the higher the hair, the closer you are to God). Haha! I ended up getting 4th in my trad set and could not be more pleased. Next year, Senior Ladies! I am pumped! 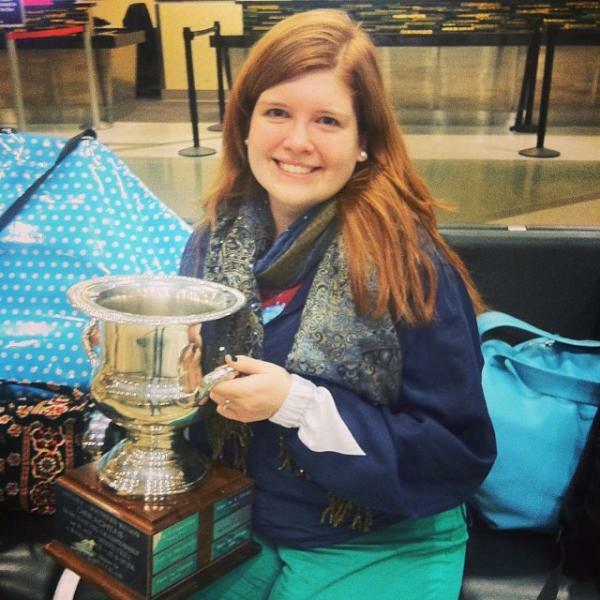 Also, #3 is a bonus picture with the 15&O 4-hand trophy that my school won. So proud of those kids! You looked amazing and danced so very well. Congratulations! Your dress is gorgeous. I saw you (from a distance) at the Oireachtas; congrats on your recall! Looking forward to dancing with you in Senior Ladies next year!